Background: Root canal infection has multibacterial etiology. The success of the endodontic treatment is directly influenced by the elimination of microorganisms from infected root canals. Many authors have suggested that to eliminate bacteria from the root canals predictably, the adjuvant method or agent is recommended. Aims: The present study was conducted to evaluate and compare the efficacy of Nd:YAG laser, ozonated water, and ultrasonic irrigation using 3% sodium hypochlorite for disinfection of root canal. Methodology: In thirty single-rooted teeth, access opening and instrumentation till #25 file was done under rubber dam. The first sample was collected by introducing a sterile paper point for preoperative microbial sampling. Ten teeth in each group were treated with Nd:YAG laser, ozonated water, and ultrasonic irrigation using 3% sodium hypochlorite for disinfection of root canal. The second sterile paper point was placed to collect the postoperative sample. Paper points were put in a test tube containing transport medium and sent for microbiology laboratory. Results: According to the results of the present study, there was highly significant difference (P < 0.0001) in percentage reduction in all the three study groups. There was a statistically highly significant difference (P < 0.0001) in pre- and post-operative colony-forming units in samples treated with ultrasonic irrigation with 3% sodium hypochlorite (Group III). Conclusions: In the current study, ultrasonic irrigation with 3% sodium hypochlorite was the most effective treatment modality as compared to Nd:YAG laser and ozonated water for disinfection of root canal. WD Miller in 1890 was perhaps the first to associate disease and inflammation in the jaws with the infected dental pulp canal space. One of the crucial points in endodontic therapy is to disinfect root canal before root filling because of the role of bacteria and their by-products in both the initiation and perpetuation of pulpal and periapical disease. The mechanical action of the instruments alone is not effective in cleaning a root canal satisfactorily owing to the complexity of the internal dental anatomy, for example, apical, deltas, lateral canals, and accessory canals. Hence, this process is conventionally carried out by the mechanical action of the endodontic instrument on the canal walls, the chemical action of the irrigating solutions, and the physical action of the irrigation/aspiration process. In our routine endodontic procedures, many a times, just chemomechanical therapy is not sufficient to debride the root canals. Therefore, newer modalities or devices must be tried and tested in vivo for complete disinfection of the root canal. Literature documents numerous “ in vitro” research on the efficacy of sodium hypochlorite alone or ultrasonically activated ozone therapy and a few on lasers. However, “in vivo” research studies are very few. Hence, this study evaluates the efficacy of Nd:YAG laser, ozonated water, and ultrasonic irrigation using 3% sodium hypochlorite for disinfection of root canal. The aim of the study was to evaluate and compare the efficacy of Nd:YAG laser, ozonated water, and ultrasonic irrigation with 3% sodium hypochlorite for disinfection of root canal. Thirty Patients who enroll at the Outpatient Department of Dr. D. Y. Patil Dental College and Hospital requiring root canal treatment in single-rooted teeth of maxillary incisors, canine and mandibular incisors, canines, and premolars were identified. A detailed dental and medical history with preoperative radiographs of the patients was taken. In radiographic and clinical examination, all teeth having apical pathosis were selected. Approval was obtained from the Institutional Ethics Review Board with Ref no EC/DYPDCH/CONS/01/2010. Procedure was explained to the patient and informed written consent was taken. Group III: Ultrasonic irrigation with 3%NaOCl (n = 10). Local anesthesia with 2% lignocaine was administered at the site of disease. Single tooth isolation using rubber dam (Hygienic, Coltene Whaledent) was done. Antisepsis of the operating field was performed with 10% povidone-iodine solution (Betadine). A high-speed handpiece (NSK, Japan) and sterile round bur BR 46 (Mani, Inc., Dental products, Japan) were used to remove the carious tooth structure or restoration and access to the root canal was achieved. A #10K file (Dentsply) was used to penetrate the apical foramen and to check the patency or any curvatures in root canal. Working length was established using apex locator (iRoot). This was confirmed with an intraoral periapical radiograph. Instrumentation till #25 K file (Dentsply) was done, and irrigation was carried out with saline till no further debris or other particulate matter was visible. Apical gauging was done to size 25 at least. The first sample was collected by introducing a sterile paper point (Dentsply) with a diameter comparable to the full length of the canal and retained in position for 60 s for microbial sampling. If the root canal was dry, a small amount of sterile saline solution was introduced into the canal to ensure viable sample acquisition. The paper point was immediately placed in the test tube containing brain heart infusion (BHI) transport medium (HiMedia) and was sent to the laboratory, for microbiology processing. The bacterial counts were measured for a number of colony-forming units (CFUs). The paper points were transferred into BHI broth for 1 h to obtain samples for the microbiological examination. Then, 10 μl each of pre- and post-operative sample was inoculated on sheep blood agar plates (HiMedia) using micropipette (Nichipet EX Autoclavable Digital Micropipette) andstreaking was done. The agar plates were then placed in incubator (York Scientific Industries Ltd., India) for 24 h. The classic bacterial count technique was used to assess the total number of viable bacteria in CFU per milliliter. Nd:YAG laser (Fotona) of 1064 wavelength with standard settings of 15 Hz at 100 mJ = 1.5W at pulsed mode was repeated four cycles for 5s each. A 200U optical fiber 2 mm short of working length was introduced into root canal without activating laser. Then, laser was activated and fiber guided in apical to coronal direction with circular movements and in contact with wet root canal walls. Canal was moistened with normal saline which was replenished to keep the root canal moist after every laser cycle. Ozonated water was produced from ozone unit (Sanjeevani Stoma Ozone) by electric discharge through oxygen current and bubbled into 1 L sterile distilled water at 7/gh ozone flow rate (1.2%); 50 ml of this was used to irrigate root canal with disposable syringe. Ultrasonic irrigation of root canal was done with 3% sodium hypochlorite using endosonic K files (P5, Statelac). Ultrasonically activated #15 K file was used for 3 min at a distance of 1–2 mm short of working length with filing action for 90 s, followed by #20 K file for 60 s in a filing motion and then 30 s circumferential motion. A total of 50 ml of irrigant solution was used. Sterile paper point was then placed in root canal for 60 s to collect postoperative sample. Paper point was immediately put in test tube containing transport medium and sent for microbiology laboratory. Microbial processing of samples was done and bacterial counts were measured by CFU in all the three study groups. Temporary dressing was given with zinc oxide eugenol cement till completion of the endodontic treatment. Since sodium hypochlorite is considered gold standard and there is abundant literature showing advantages of ultrasonics as an adjuvant in root canal disinfection, this group was considered as control group. This study group was compared with ozone therapy and Nd:YAG lasers for disinfection of root canal. Statistical analysis was done using Statistical Package for the Social Sciences (SPSS) version 17 (SPSS Inc., Chicago, IL, USA). The data obtained were subjected to statistical analysis using “paired t-test.” [Table 1] shows statistical significance of pre- and post-operative samples with a mean percentage reduction in CFU among various study groups. The mean percentage reduction in CFU in Group I was 82.44%, Group II was 82.09%, and Group III was 93.68%. There was a statistically significant difference (P < 0.05) in preoperative (1700/ml) and postoperative (450/ml) CFU in samples treated with Nd:YAG laser (Group I). There was a statistically significant difference (P < 0.05) in preoperative (4200/ml) and postoperative (750/ml) CFUs in samples treated with ozonated water (Group II). There was a statistically highly significant difference (P < 0.0001) in preoperative (10500/ml) and postoperative (250/ml) CFU in samples treated with ultrasonic irrigation with 3% sodium hypochlorite (Group III). There was highly significant difference (P < 0.0001) in percentage reduction in all the three study groups. There was no statistically significant difference (P > 0.05) between disinfection carried out by Nd:YAG laser (Group I) and ozonated water (Group II). There was a highly statistically significant difference (P < 0.001) between disinfection carried out by Nd:YAG laser (Group I) and ultrasonic irrigation with 3% sodium hypochlorite (Group III). There was a highly statistically significant difference (P < 0.001) between disinfection carried out by ozonated water (Group II) and ultrasonic irrigation with 3% sodium hypochlorite (Group III). 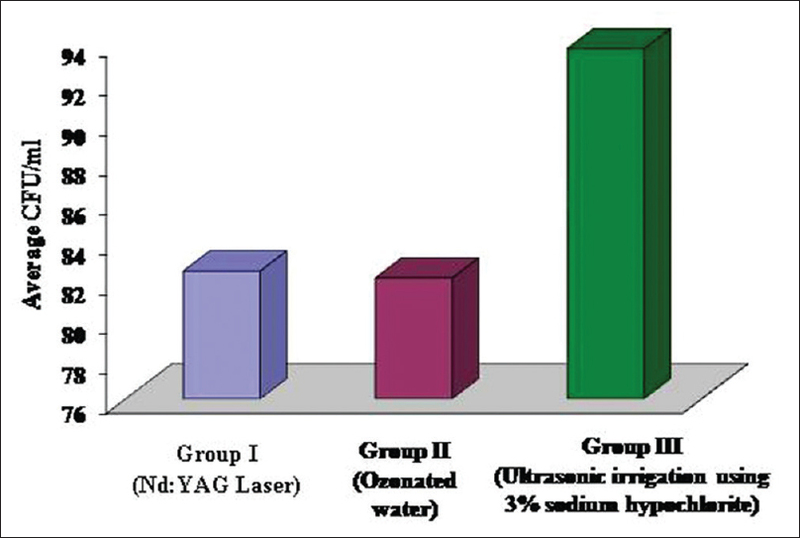 The graphical presentation of comparison of percentage reduction in CFU using Nd:YAG laser, ozonated water, and ultrasonic irrigation with 3% sodium hypochlorite is shown in [Figure 1]. The complete removal of the pathogenic bacteria and their toxic by-products is of crucial importance for the successful outcome of therapy. Failures have been documented not only in multirooted teeth but also in single-rooted teeth. The discrepancy of the penetration depth of microorganisms and bactericidal irrigating solutions often holds responsible for treatment-resistant cases and long-term failures which can be observed in conventional endodontics. Literature documents the use of various other adjuvant treatment modalities for disinfection of root canal such as ultrasonics, ozone, and lasers. In the present study, in Group I, mean preoperative CFU was 1700/ml which was reduced to 450/ml using Nd:YAG Laser. In Group II, mean preoperative CFU was 4200/ml which was reduced to 750/ml using ozonated water. In Group III, mean preoperative CFU was 10,500/ml which was reduced to 250/ml using ultrasonic irrigation with 3% sodium hypochlorite. Inter- and intra-group comparison showed statistically significant reduction in microorganism (P < 0.05). There was highly significant difference (P < 0.0001) in percentage reduction in all the three study groups. There was no statistically significant difference (P > 0.05) between disinfection carried out by Nd:YAG laser (Group I) and ozonated water (Group II). There was a highly statistically significant difference (P < 0.001) between disinfection carried out by Nd:YAG Laser (Group I) and ultrasonic irrigation with 3% sodium hypochlorite (Group III). There was highly statistically significant difference (P < 0.001) between disinfection carried out by ozonated water (Group II) and ultrasonic irrigation with 3% sodium hypochlorite (Group III). Lasers were introduced to dentistry and have some applications in endodontics. Particularly, using a neodymium (Nd:YAG) laser, Altamura et al. found that smear layer and debris removal were effective at a lower power level of 2 W, 100 mJ energy, and 20 Hz pulse rate. Most lasers are heat-producing devices converting electromagnetic energy into thermal. These lasers find uses in oral surgery for cutting or coagulating soft tissues or in the welding of dental prostheses. More recently, new types of lasers have offered nonthermal modes of tissue interaction, called photoablation, photodisruption, and photochemical effects. The effect of laser radiation on tissue depends on various properties of the material, for example, specific absorption, chemical structure, and dentistry. On the other hand, the properties of the laser radiation, for example, wavelength, energy density, and pulse duration, must be taken into consideration. The basis of the photochemical effect is the absorption of laser without any thermal change in the chemical and physical properties of atoms and molecules. When fiber is placed in the canal, there is a physicochemical change on the molecular level which acts on bacterial cell wall and leads to cell wall degeneration. Canals irradiated with Nd:YAG lasers may have reduced permeability due to melting action of the beam on the dentin. Smear layer and debris removal are effective at low power., The only disadvantage of using laser disinfection is the cost involved in the investment of this equipment. Advantage of lasers in dentistry helps in good control of bleeding, better visualization of the surgical field, can be completed in single visit. Procedures can be performed with less injectable anesthesia, with reduced postoperative discomfort and swelling. Gutknecht et al., 1996, achieved an average of 99.92% bacterial reduction in the root canal using the Nd:YAG laser with standard settings of 15 Hz at 100 mJ = 1.5 W, repeated four times for 5–8 s. In 1994, Rooney et al. and Hardee et al. described reductions of 99% when using a Nd:YAG laser in different experimental designs and bacterial combinations. In 1997, Klinke et al. were able to prove the bactericidal effect of Nd:YAG laser at a depth of 1000 μm. In comparison, a rinsing solution such as NaOCl only achieves effective bacterial reduction up to a depth of 100 μm. Ozone is a blue gas, containing three oxygen atoms; it is irritant, toxic, and unstable; it is also very reactive. Ozone is one of the most powerful antimicrobial agents available for use in medicine or dentistry. Ozone is an effective, easy, cheap, and fast antioxidant to help disinfect root canals. Ozone is much stronger than chlorine and acts 3000 times faster without producing harmful decomposition products. As aqueous ozone revealed the better level of biocompatibility compared with commonly used root canal irrigants. Literature has documented the antimicrobial effectiveness of ozone in the form of a gas and as ozonated water. Sanjeevani Stoma Ozone unit used in this study produced the ozonated water, which delivered 70 ppm/L/min and has been proven to be safe. It is a painless procedure with the absence of side effects. However, it may cause a headache or irritation to eyes if proper technique or precautions are not followed. It has been reported that ozone, in the gaseous or aqueous phase, has a strong oxidizing power with a reliable microbicidal effect, and it is generally accepted that oxidation mediated by ozone destroys the cell walls and cytoplasmic membranes of bacteria and fungi. After the membrane is damaged by oxidation, its permeability increases and ozone molecules can readily enter the cells, causing the microorganism to die. Sodium hypochlorite is considered as gold standard as a root canal irrigant for disinfection of root canal. Studies have shown that, when activated ultrasonically, it potentiates and enhances the antibacterial efficacy of NaOCl. Hence, with minimal upgradation of existing armamentarium in a dental operatory like endosonic equipment, disinfection of the root canal can be achieved better than conventional method. Use of ozone therapy and Nd:YAG laser is adjuvants. Use of sodium hypochlorite is still being the gold standard in disinfection of root canal system. Ultrasonic irrigation with 3% sodium hypochlorite showed 94%, Nd:YAG laser 82%, and ozone 82% reduction in CFU. Ercan E, Dulgergil T, Yavuz I. The Effects Of Antibacterial Solutions On Microorganisms Isolated From Infected Root Canals In Vivo, Biotechnol & Biotechnol Eq 2006. p.149-56. Passarinho-Neto JG, Marchesan MA, Ferreira RB, Silva RG, Silva-Sousa YT, Sousa-Neto MD, et al. In vitro evaluation of endodontic debris removal as obtained by rotary instrumentation coupled with ultrasonic irrigation. Aust Endod J 2006;32:123-8. Negishi J, Kawanami M, Ogami E. Risk analysis of failure of root canal treatment for teeth with inaccessible apical constriction. J Dent 2005;33:399-404. Altamura C, Majori M, Bedini R, Filipini P. Evaluation of Nd:YAG laser effects on root canal walls. J Oral Laser Appl 2003;3:67-72. Levy G. Cleaning and shaping the root canal with a Nd:YAG laser beam: A comparative study. J Endod 1992;18:123-7. Pong Yin NG. Sterilization in root canal treatment: Current advances, Hong Kong. Dent J 2004;1:52-7. Crespi R, Lando G, Covani U. Cleaning of root canals with Nd:YAG laser. An vivo study. J Oral Laser Appl 2003;3:27-31. R Hardee MW, Miserendino LJ, Kos W, Walia H. Evaluation of the antibacterial effects of intracanal Nd:YAG laser irradiation. Journal of Endodontics 1994;20:377-80. Thomas Klinke, Antibacterial Effects of Nd:YAG Laser Irradiation within Root Canal Dentin.. Journal of Clinical Laser Medicine & Surgery 1997;15:29-31. Estrela C, Estrela CR, Decurcio DA, Hollanda AC, Silva JA. Antimicrobial efficacy of ozonated water, gaseous ozone, sodium hypochlorite and chlorhexidine in infected human root canals. Int Endod J 2007;40:85-93. Bocci VA. Scientific and medical aspects of ozone therapy. State of the art. Arch Med Res 2006;37:425-35. Bocci V. Oxygen-Ozone Therapy: A Critical Evaluation. Netherlands: Kluwer Academic Publishers; 2002. Lynch E. Evidence-based efficacy of ozone for root canal irrigation. J Esthet Restor Dent 2008;20:287-93. Bezrukova IV, Petrukhina NB, Voinov PA. Experience in medical ozone use for root canal treatment. Stomatologiia (Mosk) 2005;84:20-2. Nagayoshi M, Kitamura C, Fukuizumi T, Nishihara T, Terashita M. Antimicrobial effect of ozonated water on bacteria invading dentinal tubules. J Endod 2004;30:778-81. Clarkson RM, Moule AJ. Sodium hypochlorite and its use as an endodontic irrigant. Aust Dent J 1998;43:250-6. Griffiths BM, Stock CR. The efficiency of irrigants in removing root canal debris when used with an ultrasonic preparation technique. Int Endod J 1986;19:277-84. Cunningham WT, Martin H, Forrest WR. Evaluation of root canal débridement by the endosonic ultrasonic synergistic system. Oral Surg Oral Med Oral Pathol 1982;53:401-4.